I need to get out my real camera, but in case I don’t get a chance to do that before the flowers pass, I wanted to capture where the blooms are right now. I’m enjoying watching everything fill in. I’ve got my fingers crossed that next year, when everything is a bit more established, it will begin to fill in more. The bees, small butterflies, and hummingbirds were out in full force yesterday. Still not seeing many of the larger butterflies yet, though — the monarchs and swallowtails. I remember having to wait a long time for them last year as well. We’ve got two bird feeders out back, which we love to watch. Birds are super active in the newly planted back hill, including ground birds like doves and robins. With the higher bird population, I fear for the poor caterpillars out there. Rue is generally covered in swallowtail caterpillars, and I’ve only seen one so far this year. I’m hoping with the variety and number of plants out there, they’ll be able to find some shelter and at least grow up to become butterflies. I am now at the end of my week-long gardening vacation. For the first four days, I was in the garden all day almost every day, coming inside only quickly to eat lunch. 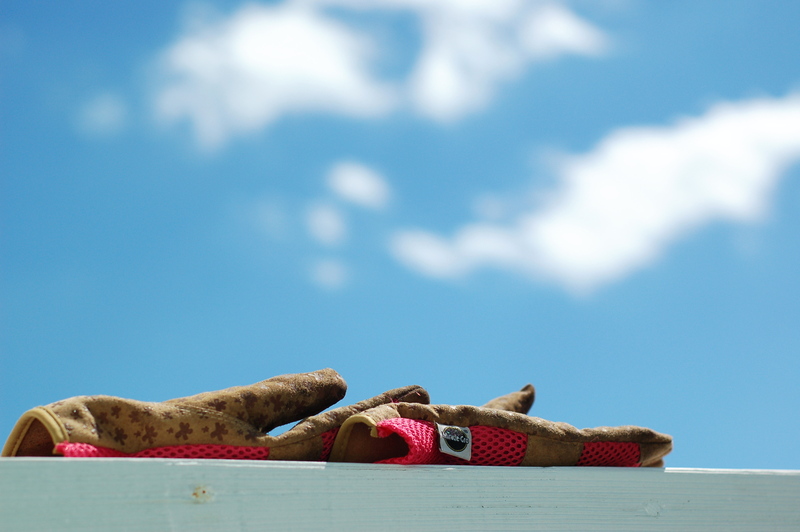 I was so occupied in the garden — moving plants, edging beds, spreading mulch — I didn’t even come inside for my afternoon coffee. On Tuesday I repotted tomato seedlings, trimmed rosemary, fertilized yews, planted a fuzzy lamb’s ear for our daughter, and then finished mulching the front beds. On Saturday, three Virginia Tech students arrived in a cold drizzle to spread mulch on the back hill bed as part of the VT Big Event, a day of over 1000 service projects in the town of Blacksburg, from the students of Virginia Tech to the residents of the town in thanks for supporting the student body throughout the year. It was miserable out there, and when it started sleeting, I sent them home. They had gotten about half of the hill done. The sleet turned to snow for my husband’s April 7 birthday. The snow melted off pretty quickly this morning, Sunday, the final day of my gardening vacation. My husband started spreading the remaining mulch out back before lunch, and I took over after lunch while he ran errands with the kids. As the mulch pile shrank, we realized we were going to come up short. I ordered 12 cubic yards, and I spread the final wheelbarrow full still having several small areas that need mulching. I should have ordered 14 or 15 yards and saved any leftovers for filling in throughout the summer. Next year! Now it just needs to start warming up, the plants need to start growing, and I need to fill in those empty spaces with perennials, grasses, and seedlings I’ve got growing in my office. The blueberries are about to flower, the blue Salvia is working on its buds, and the Redbud tree is about to burst into magenta bloom. The Echinacea are pushing up leaves, as are the rue and the bee balm. Joe pye and milkweed should start pushing up leaves soon too. The milkweed was emerging April 14 last year, and Joe Pye weed as well. We’ve got one more small snow in the forecast, and then some warm temperatures coming at the end of the week. I’ve got my fingers crossed there will be more green by next weekend, and lasting warmth. I weeded this morning, and while doing that, I moved some pink salvia volunteers from the front bed to the herb bed and to the meadow garden out back. I also moved some of the wildflower seedlings around by the mailbox to declump them and distribute them a little more evenly. Both rounds of wildflower seeds are coming up out back. The only thing I was still missing back there was milkweed. I drove over to the Crow’s Nest nursery to see if they had any since they didn’t on any of my million trips prior to today. They had $10.99 gallon pots (I think they’re a gallon) in yellow, orange, pink, and white. The only one blooming was the yellow one, and I really want something blooming back there while we wait for everything else to come in, so I got yellow though I had originally intended to get orange. I put it in the ground on the hill today, and we’ve got one week to water it in before vacation. When I returned home after a weeklong trip to Whistler, I was giddy to walk around the garden and find not one monarch butterfly emerging from its chrysalis, but two. After finding those, I of course crawled around in the mulch and dirt to inspect the undersides of leaves. I found three more monarch chrysalises plus a bunch of fat swallowtail caterpillars who will soon be crawling off to metamorphasize as well. Some friends at work are also interested in butterfly gardening, and are looking for host plant ideas. 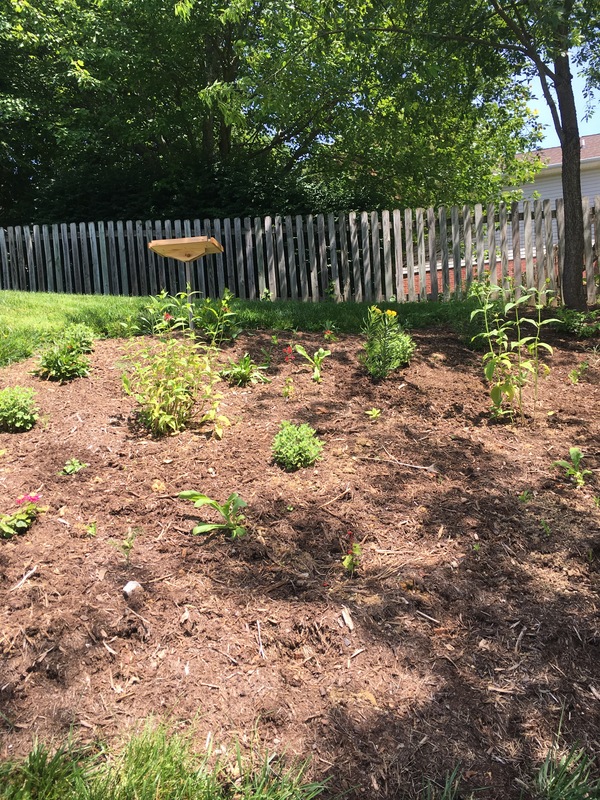 Since we work for a company that makes, ahem, blogging software, my friend naturally asked “Did you do a blog post on what all you planted?” Nudge nudge. Shockingly, I have not. So here it is! Kris and Liz, this is for you. Milkweed (Asclepias): We planted both common milkweed and swamp milkweed. These are by far the most insect-loved plants in the garden. They are constantly covered in various species, including aphids, beetles, and, late in the summer, monarch caterpillars. Milkweed is both a nectar plant and a host plant. We’ve seen adult giant swallowtails and monarchs drinking from its flowers, and have found at least a dozen monarch caterpillars on it. Word of warning: milkweed will get covered in aphids. The caterpillars will still come even when every surface is crawling with aphids, so we kept our milkweed intact even though it’s not very attractive once it has stopped flowering and it’s coated in tiny orange insects. Rue (Ruta graveolens): This is possibly my favorite addition to the garden. The leaves are a silvery blue-green, the plant stays neat and tidy (it doesn’t get leggy or messy), it can take the heat (and drought) and still look healthy, and the swallowtail caterpillars adore it. As an unexpected bonus, the monarch caterpillars love it for building chrysalises. We’ve found at least 3 chrysalises in the small, shin-high plants. Milkweed: all the butterflies big and small love milkweed. Indigo salvia: Aside from the milkweed, these purple flower spikes are the most popular in the garden for butterflies to drink from. Bees also love these flowers. Pink salvia: Okay, maybe these are tied with the indigo salvia for nectar popularity, at least for hummingbirds. I see hummingbirds drinking from these almost every time I sit in the garden. Bee balm (Monarda): Butterflies and hummingbirds love this as well. Hummingbirds dart between the pink salvia and the bee balm. Thai basil: I’ve seen some small butterflies and moths (and caterpillars) on these flowers. Cone flowers: Butterflies always visit these. Joe Pye weed: Butterflies love to drink from Joe Pye flowers. Joe Pye weed gets really tall and floppy unless you get the dwarf varieties. Parsley: parsley is a host plant for swallowtails, but the swallowtail caterpillars definitely opted for the rue over the parsley, at least this year. I didn’t find any caterpillars on the parsley, and found at least a dozen on the rue. I guess the parsley is the only one :-). We have lots of other nectar flowers — brown-eyed Susans, Mexican blanket flowers, some other stuff I can’t remember the names of — but the ones I listed above were definitely the most successful. If you can identify any of the caterpillars in the catalog, please let me know! I think most of them are probably moths, but I don’t have a good ID book. Earlier in the year, I wrote multiple times about our different strategies for killing grass to build a flower bed. 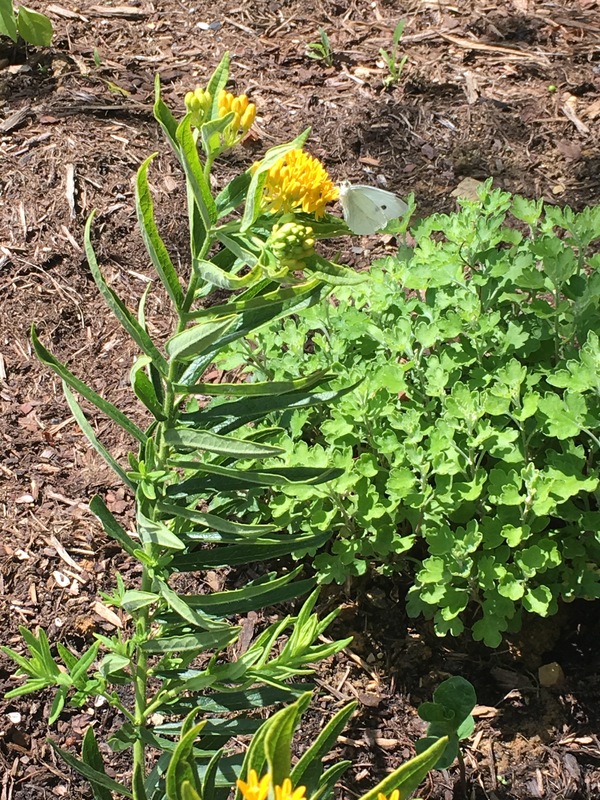 Since then I’ve blogged pictures from the garden, from reading, writing, butterfly-watching, and blogging under our dogwood tree, and photographs of the butterflies and caterpillars who live in the small ecosystem we helped create. 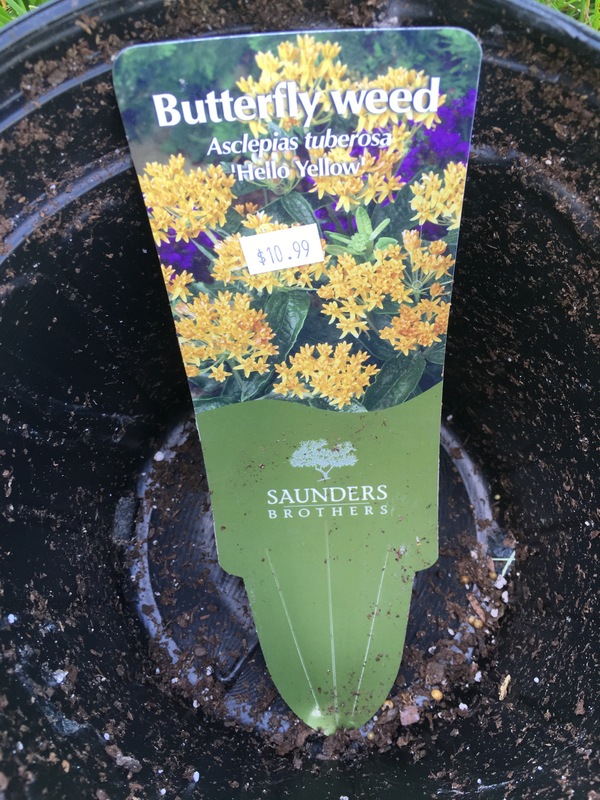 I wanted an herb garden and a butterfly garden, now we have both butterflies and herbs. We’ve made endless batches of pesto and basil gin smashes. The kids and I check for caterpillars and chrysalises every day. At last count we have about 8 monarch caterpillars and 10 swallowtail caterpillars, and we think we found a monarch chrysalis in progress yesterday in the rue bush. All the work has paid off :-). It is a warm, rainy Christmas day. We opened gifts, ate cinnamon rolls, and lounged all morning amidst shiny bows and piles of ripped wrapping paper. The cats are playing in cardboard boxes, our daughter is messaging me from across the room on her new iPod, our son has completed his fifth reading of the Catan instructions so we can figure out how to play, my husband is in the garage building a bed, and I am staring out the window at wet gray branches, listening to the soft patter of rain. I wish I had a seed catalog. The weather feels more like spring than winter — we have the sliding glass door open to welcome fresh air — and with an empty, lazy day indoors, I’d love to thumb through a catalog of leaves and flowers, day-dreaming about the garden we will plant in spring. It has been years since I’ve planned, planted, or tended a real garden. I puttered in Minnesota, but never really dedicated myself. On my recent birthday, when our son gave me a book about butterfly gardening, I spent two days sketching: plotting groupings of host and nectar plants, visualizing colors, planning my kill of large swaths of grass to make room for flower and herb beds. I may be be overambitious. As far as gardening goes, Virginia soil is foreign to me, as are seasons. In Florida we had a wet season and a dry. There were no freezes; there were no thaws. The main challenges were a scorching sun and the relentless growth: without a winter, there was no break from weeding. Since I know nothing, it may be wise to start seeds indoors instead of buying hundreds of dollars worth of mature plants. We can buy a packet of seeds — enough for multiple groupings — for a fraction of the cost of a single potted plant. Now, with Christmas rain coming down and a kitten in my lap, I want to turn the pages of a magazine-paper catalog. I want to circle the herbs and flowers we hope to grow, tabulate costs, and daydream about a garden in the front of our new house, green, and filled with sunshine and butterflies. If you know of a good free seed catalog, or follow any Virginia gardening blogs that might help a newbie like me, please let me know in the comments. Thanks!